Well, we have seen Natsume Rin’s prototype along with Noumi Kudryavka and Kamikita Komari were still merely designs/drawing previously, and now all of them have appeared in complete version – courtesy of Japanese Rakuten website. 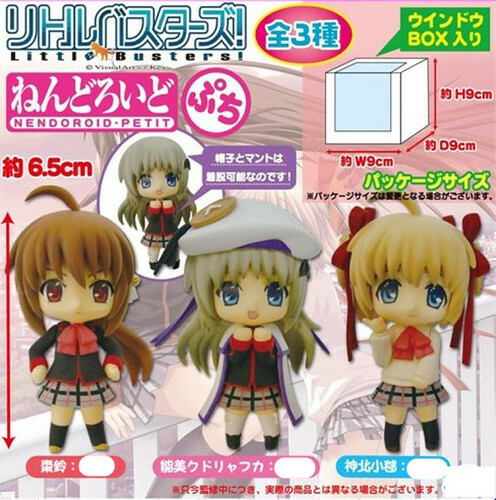 Yes, apparently they will be packaged in one set, under the name: Nendoroid Petit Little Busters! set. ← Happy 1st Anniversary, Nendonesia and Nendonesian! Always wanted to ask this, this series is a collaboration between bandai & GSC? Cause always saw it have a bandai logo on it’s advertisement pic. Sorry, long follower of nendo but still confused. I guess this Petit is not manufactured by GSC, and it might be distributed by Bandai in some way.